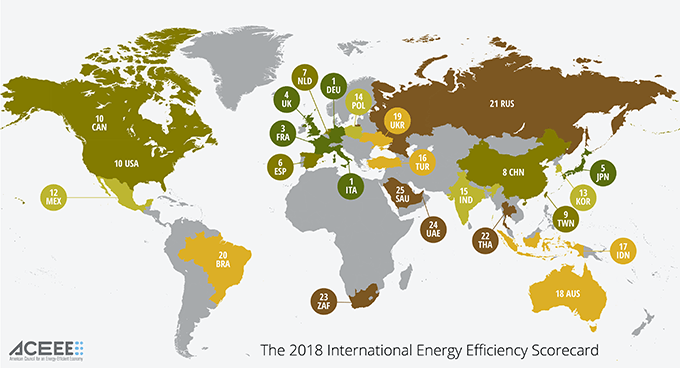 The International Energy Efficiency Scorecard ranks the world's largest energy-consuming economies on their energy efficiency policies and programs. The rankings include Australia, Brazil, Canada, China, France, Germany, India, Indonesia, Italy, Japan, Mexico, Netherlands, Poland, Russia, Saudi Arabia, South Africa, South Korea, Spain, Taiwan, Thailand, Turkey, the United Kingdom, and the United States. Thirty-five different energy efficiency indicators have been analyzed for each economy ranked in the report. The rankings are determined by scoring out of 100 possible points. Points can be earned in four different categories, including buildings, industry, transportation, and national effort, which measures overall or cross-cutting indicators of energy use at the national level.